After attending the Northeast Flower Expo at the beginning of the year I have been dying to get to another one. I flew to Chicago for the International Floriculture Expo this week and had the best time! I flew in Monday to be a "florist tourist". It was my second time there and I had made a list of everything I wanted to do and see. I started off with breakfast at Brunch before I walked down to the Wendella Architectural Tour. If you ever go to Chicago you need to do this tour- hands down! It was my second time and I would do it a hundred more times. Fun tip: they sell beer and wine on the boat! I lucked out with sunshine and warm weather as I made my way through all three branches of the Chicago River admiring the historically rich and breathtaking buildings. I made a pit stop to take a selfie at Cloud Gate and wandered through the Lurie Gardens before going to the Art Institute of Chicago. Voted one of the top museums in the WORLD, I got to see Van Goghs, Monets and a Warhol, tons of ancient jewelry, ceramics and statues and flawless handmade furniture. I discovered my love for Saul Steinberg at the AIC. 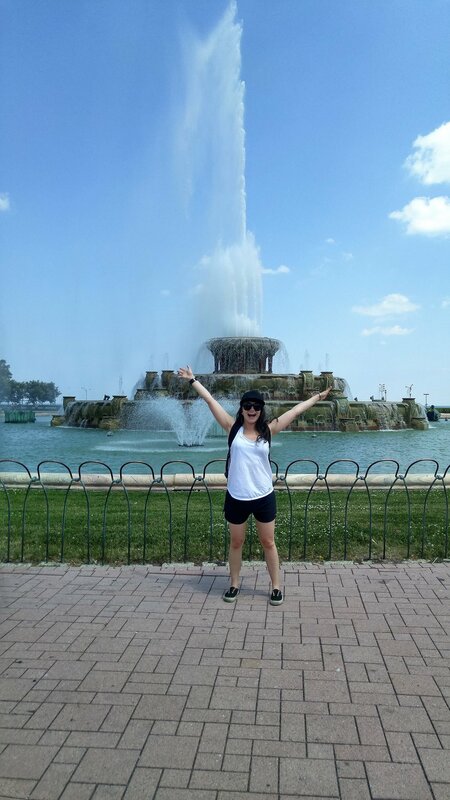 Walking home I saw the stunningly beautiful Buckingham Fountain. My picture below doesn't do it justice for how big this thing is. That was fun, but Tuesday and Wednesday at the Expo was my happiest place. Tuesday was non stop educational sessions with a focus on the business side of the industry. I got a sneak peek at a new floral design program (still in beta) and acquired new marketing techniques. Some of the speakers this day included designer Heidi Stachel, 'Supermarket Guru' Phil Lempert, J Schwanke of UBloom (pictured above!) and Renato Soqueco of BloomNet. I was among the talented and successful people in the flower biz. The evening ended with the 'Toast to the Industry' reception with cocktail and small bites and an award ceremony. I flew out Wednesday early evening so I wanted to make the most of my day. I was able to meet a good amount of wholesalers I look forward to working with in the future, offering farm fresh product direct to me! I was inspired by lots of the booths covered in lush florals. I was introduced to David Coake, the editor-in-chief of Florists' Review, fangirled over meeting The Flora Culturist Stacey Carlton AIFD and heard Lisa Waud talk about her project The Flower House. Nerding out is an understatement. I came home motivated more than ever. The second half of this year is going to be unbelievable for Russo Fabulous and I am excited to share everything with you all! Big shout out to the people I met at IFE reading this- I owe you a huge hug. You're amazing. Thank you.